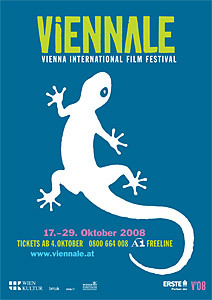 Vienna’s international film festival, the Viennale also begins this weekend and runs from October 17-29. Apart from giving me an excuse to post an image of the very cool poster, it also alerted me to the existence of Austrian documentarian Erwin Wagenhofer’s new film. Entitled Let’s Make Money, it promises to be a timely exploration of how the financial industry has reached all around the world, putting the security of the whole world at risk. Both screenings are already sold out, and I’m hopeful this will make it to Toronto by the 2009 version of Hot Docs, or hopefully, even sooner. Doc Soup programmers, are you listening? This entry was posted in Documentaries, Film Festivals and tagged austria, vienna, viennale. Bookmark the permalink.